Sligo, Ireland: From the iconic Cliffs of Moher to Dublin’s fascinating history, crowds can’t resist Ireland’s best-known destinations. But if dodging selfie sticks to get a stunning photo or waking up at the crack of dawn to enjoy the view crowd-free doesn’t sound like the ideal adventure, Wilderness Ireland offers alternatives to explore lesser known destinations that are equally breathtaking without the crowds. Forgo sitting in traffic to view the Ring of Kerry and instead cycle the more rugged and untouched Ring of Beara, or skip a popular day trip to the Aran Islands for a more relaxing experience to the striking landscape of Cork’s Cape Clear Island. The 200-meter-high Cliffs of Moher are a towering landmark and probably Ireland’s most iconic sight to behold. But as magnificent as they may be, the narrow cliff-side path is often bottlenecked with people jostling for the same view, which takes a bit of the magic out of the experience. The dramatic Slieve League Cliffs in Donegal, Ireland’s most northwestern county, are actually taller, clocking in at 600 meters, making Slieve League nearly three times higher than the Cliffs of Moher. The exceedingly dramatic sea cliffs are far less visited, so you can enjoy the panorama without the crowd. See the cliffs with Wilderness Ireland on Hiking the Causeway Coastal Route & Donegal. Though a city with a rich history, Dublin is also busy, expensive, and packed with tourists. Getting a hotel room in peak season can be difficult, the main sights tend to be crowded and finding local restaurants can be a task in itself. By comparison, Belfast is the perfect opposite. Northern Ireland’s capital city is just as cosmopolitan and hip but lacks the crowds of Dublin. Prices are reasonable, and you don’t have to worry about tourist traps. Belfast has an up-and-coming foodie scene and has seen significant revitalization of its streets, including the new Titanic Museum. Visit Belfast our Wilderness Ireland’s family adventure, Giants, Myths & Legends. The Aran Islands are known as bastions of the Irish language as well as the traditions and customs of an old Ireland. However, their proximity to the ever-popular Galway and the recent uptick in day tours to the islands means that they are visited by thousands each year. If you’re looking for an island retreat within a lost Ireland, head south to Cork’s Cape Clear Island, officially known as Cléire. Here, you’ll find a small but thriving Gaeltacht community where the islanders mix modern with old – and you’ll enjoy some of the best weather in Ireland. Explore the island with Wilderness Ireland on Hiking and Island Hopping Cork & Kerry. Every year, hundreds of thousands of people flock to the Iveragh Peninsula’s famous and beautiful Ring of Kerry to drive the ring road around the peninsula, meaning that most visitors only see the wilds of Kerry from the window of a car or bus while sitting in traffic. For visitors who prefer to get off the beaten path, explore the Ring of Beara, the peninsula south of the Iveragh Peninsula. 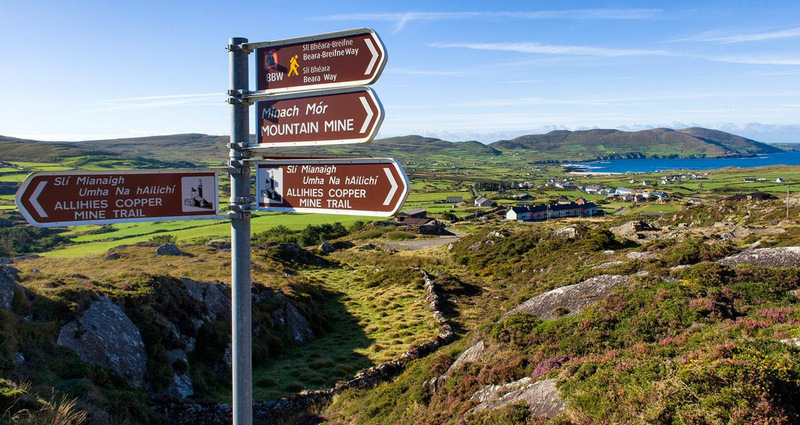 The narrow Beara Peninsula is far more rugged and wild, offering great coastal hikes, the Allihes copper mines, clifftop signal towers, and the spectacularly winding Healy Pass. Visit the Ring of Beara with Wilderness Ireland on Bike Tour – Coast to Coast. Ireland has six national parks, but for most visitors it’s all about Killarney. Killarney National Park is handy in that it’s walking distance from Killarney town – but that also means that the breathtaking views and landscapes are full of visitors. If you’re looking for wilderness, head north to Glenveagh National Park. Accessible from the northern city of Letterkenny but far enough away to keep less adventurous crowds at bay, Glenveagh National Park offers roaming peaks, cascading valleys and the idyllic Glenveagh Castle clinging to the shores of Lough Veagh. Discover Gleanveagh National Park with Wilderness Ireland on Bike Tour – Donegal From Cliffs to Coast. While it’s true that there’s no replacing the strange geology of Giant’s Causeway and the intriguing myth of how it came to be created, the unique landmark is consistently crowded and insists on charging a hefty price to park your car. To avoid the crowds while exploring the strange geological phenomenon of the island, head south to the Burren, an exposed limestone landscape in Co Clare. Just as strange and alien, this barren landscape is scattered with megalithic monuments, a rainbow of wildflowers, and is known for its delicious food. See the Burren with Wilderness Ireland on Hiking the Burren, Aran Islands and Connemara. To learn more about getting off Ireland’s beaten path, visit wildernessireland.com. Wilderness Ireland specializes in offering a range of adventure vacations, guided tours and incredible wilderness experiences. Operating independently from its award-winning sister company Wilderness Scotland since 2012, their trips are designed by locals and delivered by local legends. Wilderness Ireland’s personalized, professional and innovative approach to travel ensures a perfect blend of the most stunning locations, authentic local experiences, beautiful accommodations and Ireland’s growing reputation for fresh ingredients and creative cuisine. The team of knowledgeable and standout wilderness guides and staff know Ireland inside and out and are committed to providing travelers with excellent customer service and the best possible adventure experience of Ireland. For more information, visit wildernessireland.com.